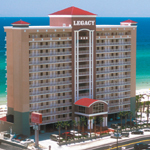 Legacy by the Sea is one of Panama City Beach’s most popular hotels. Ideally located across the street from Gulf World Marine Park and walking distance to the Pier Park shopping, dining and entertainment complex, the 14-story Legacy boasts an expansive lobby where guests can enjoy stunning gulf views with their FREE continental breakfast. Other amenities include gulf-front rooms with private balconies and fully-equipped kitchens, posh penthouse and Jacuzzi suites, a heated, gulf-front pool and whirlpool, a FREE kids meal for every adult meal purchased at our beachfront bar and grill, a laundry facility, a gulf-view fitness center, a computer desk and more. Legacy by the Sea is consistently ranked in Panama City Beach’s top five on tripadvisor.com where guests write the reviews and is graded A by the Better Business Bureau. The Legacy is an official sponsor of Panama City and Panama City Beach’s hottest special events including Spring Break, Thunder Beach, Emerald Coast Cruizin’ and several sporting events. Many Ironman Florida triathletes choose the Legacy! We’re saving you a front row seat on Panama City Beach at Legacy by the Sea!